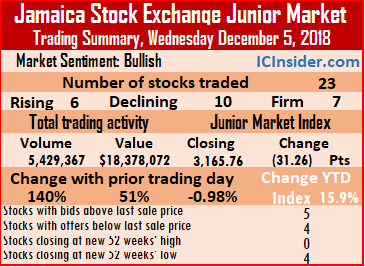 Trading on the Junior Market of the Jamaica Stock Exchange ended on Wednesday with a fall in the Index of 31.26 points to 3,165.76 after 6 securities advanced, 10 declined including 4 closing at 52 weeks lows, while 7 remained unchanged as 23 securities changing hands versus 26 on Tuesday. Trading resulted in an exchange of 5,429,367 units valued at $18,378,072 compared to 2,263,347 units valued at $12,188,607 trading on Tuesday. Trading ended with an average of 236,059 units for an average of $799,047 in contrast to 87,052 units for an average of $468,793 on Tuesday. The average volume and value for the month to date amounts to 247,680 units $739,994, versus 253,366 units valued at $711,095, previously. November, ended with an average of 190,475 units valued at $653,358 for each security traded. IC bid-offer Indicator| At the end of trading, the Investor’s Choice bid-offer indicator reading shows 5 stocks ended with bids higher than their last selling prices and just 4 with lower offers. 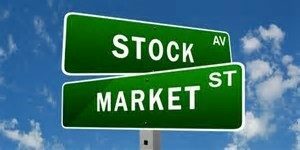 At the close of the market activity, Access Financial closed at $50.50, in exchanging 7,800 shares, AMG Packaging ended with a loss of 22 cents at a 52 weeks’ low of $1.60, with 456,962 stock units changing hands, Caribbean Producers finished trading 35,850 units, and rose 10 cents to $5.40, Consolidated Bakeries closed with a loss of 5 cents at $2.15, in exchanging 60,165 shares, Derrimon Trading ended with a loss of 5 cents at $2.65, with 149,161 shares trading. Eppley settled $9 higher at $9, with a swapping of 2,491 units, Everything Fresh traded 145,093 shares after declining 2 cents to close at a 52 weeks’ low of $1.48, Express Catering ended trading with 14,090 shares and gained 30 cents to close at $7.80, FosRich Group traded 11,862 shares, with a loss of 7 cents in ending at $4, General Accident finished trading of 1,588,279 shares with a loss of 13 cents to close at $3.50. GWest Corporation closed at $1.45, with 3,000 stock units changing hands, Honey Bun climbed 42 cents higher at $3.52, with an exchange of 1,282,416 units, Indies Pharma traded 41,622 shares and gained 6 cents to close at $3.12, Jamaican Teas settled with a loss of 10 cents at $3.70, in trading 150,700 shares, Jetcon Corporation ended trading of 1,230 stock units with a loss of 90 cents at a 52 weeks’ low of $3. 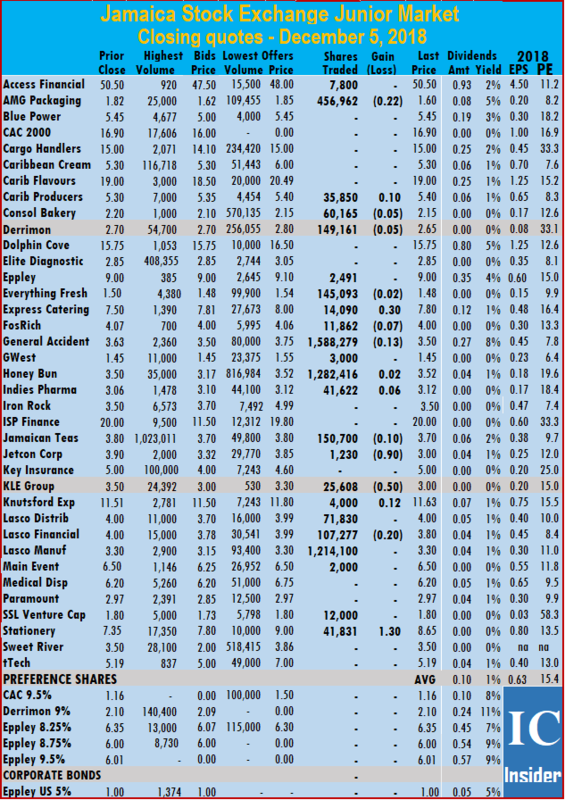 KLE Group finished trading with a loss of 50 cents at $3, in the swapping of 25,608 shares, Knutsford Express closed 12 cents higher at $11.63, trading 4,000 shares, Lasco Distributors ended at $4, with 71,830 shares changing hands, Lasco Financial concluded trading of 107,277 stock units with a loss of 20 cents to close at a 52 weeks’ low of $3.80. Lasco Manufacturing finished trading of 1,214,100 units at $3.30, Main Event settled at $6.50, with 2,000 shares being exchanged, SSL Venture Capital traded 12,000 shares to end at $1.80 and Stationery and Office finished trading 41,831 stock units with a rise of $1.30 to $8.65.